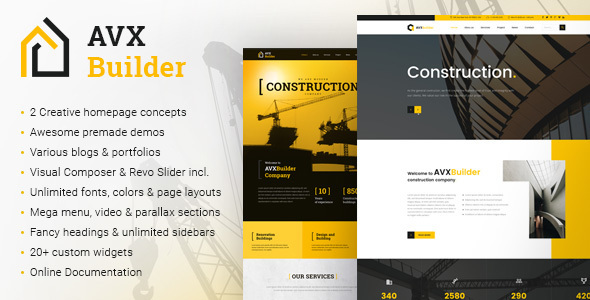 AVX Builder is WordPress optimized for the Construction & Building & Architecture Industry. Build a global business website with contemporary responsive design easily. There are two niche building concepts that feature masculine, bespoke designs that will appeal to different tastes while meeting the needs of your business website. In the industry your website is often the first impression your make on a new client – via word of mouth, marketing, Google search or referral, clients come to your website to see what you are made of. In today’s fast paced market you need to make a lasting impression and show that you know where you business can take that client. Blow them away with a design that moves with style, highlights your best work and introduces your team and allows people to connect with you on the spot, however they like. It’s this kind of user experience that CodexThemes brings to the table. With years of designing and developing some of the best selling Themes on the marketplace, we’ve created a micro niche design specifically to meet the needs of builders, designers, architects, construction and building businesses. The final outcomes is a highly finessed design for WordPress that gives you stylized pages, project templates and web elements that will make sense to your business needs and all of this comes together in a package that has a user first focus. This includes subtle but useful features like email subscription integration, Google Map integration, contact forms and custom footer and header tools designed to help you grow your business. You want to be showcase your most amazing portfolio of work with the best technologies available today so that your business stands out from the crowd without looking too flashy. We believe that AVX Builder does exactly that with carefully tailored CSS animations compiled with a subtle use of parallax backgrounds to create a professional business website that will blow your competition out of the water. Compiling our research on industry needs we have composited a website with carefully designed pages and posts that put content first, while creating a library of web elements that won’t overwhelm you, but also won’t leave you searching for that perfect pricing box, testimonial or styled list to help display your content your way. It’s all neatly packaged in the perfectly familiar WordPress backend that doesn’t require any coding on your part and you can very simply modify most components from the Theme Options Panel before you publish any changes. Convenience, power, style… all in one neat package. Every page has been carefully researched and considered to bring you a handful of useful elements that will make you look professional without all the bloat. Galleries, Team Pages, Portfolios and Projects have all been covered off as well as a fully functioning blogging platform so you can keep it all in one place and focus on the business, not burgeoning website builds. Of course you have all the normal expectations of a fully functioning website that will be met without a second’s hesitation, diagrams, contact forms, lists and tables, pricing tables, responsive design, customized widget areas, typography, shortcodes, integrated social media and endless choices of colour and font palettes from the simple to use Theme Options Panel. 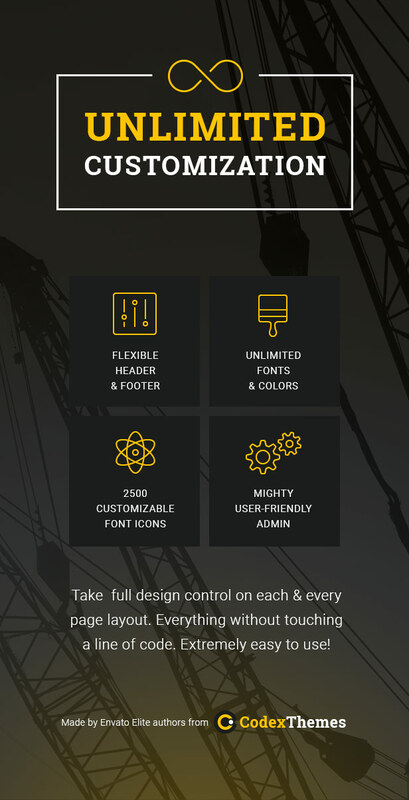 Backed by Top Quality, 5 Star Rated Support from the creators of the best selling WordPress Theme TheGem, AVX Builder is going to blow the roof off, so to speak.